Please don't let the title fool you, my friends. I promise you don't have to spend four hours in your kitchen stirring or kneading in order to make these wonderful baguettes! You will need to be around for those four hours, however, or at least be back home in one hour increments during those four hours. Have cold? Have snow? Are the kids at home because school was cancelled? Then this recipe is for you. Not only is it perfect weather for making bread but delicious, crusty, beautiful bread it is. Just imagine how happy (and less crabby) your family will be when they bite into a crusty, buttery slice of warm bread. It will ALMOST make them forget they can't go outside because they'll get frost bite. I came across this recipe on Saveur recently and the wonderful thing is that you don't need any special equipment. Yes, a pizza stone, cast iron skillet and a stand mixer with dough hook will come in handy if you have them, but they are not absolutely necessary. Place warm water and yeast in a large bowl and whisk together. Allow to sit about 10 minutes until yeast is foamy. Add the flour and stir with a fork until dough forms making sure all of the flour is absorbed. Allow the dough sit to for about 20 minutes for the flour to hydrate. Add salt, then transfer dough to a lightly floured work surface, and knead until smooth and elastic, about 10 minutes. I used my stand mixer with dough hook to knead the dough. Shape dough into a ball by pulling sides under and transfer dough to a lightly greased bow. Cover bowl with plastic wrap, and place bowl in a cold oven or microwave. Let dough rest until doubled in size, about 45 minutes. Note: My dough took longer to double so I turned on the oven light to warm the oven just a little. Transfer dough to a lightly floured work surface, and pat into an 8-inch x 6-inch rectangle. Fold the 8-inch sides toward the middle, then fold the shorter sides toward the center. Return dough, seam side down, to the bowl. Cover with plastic again, and return to oven. Let sit until doubled in size, about 1 hour. Remove dough from the oven and place a cast–iron skillet on the bottom rack. Position another rack above the skillet, and place a baking stone or pace an upside down or rimless sheet pan on it. Transfer dough to a lightly floured work surface and cut the dough into three equal pieces. Shape the pieces into 14-inch ropes. Place a piece of parchment paper on a rimless baking sheet and dust lightly with flour. Place the ropes, evenly spaced, on the paper. Lift the paper between the ropes to form pleats to separate the dough and place two tightly rolled kitchen towels on each end of the paper, creating blockades for the loaves. Cover the ropes loosely with plastic wrap and let rest until it doubled in size again, about 50 minutes. 30 Minutes for the last 50 minute rise is finished, prehead the oven to 475F. Uncover the dough ropes and remove towels. Flatten the parchment paper to space out loaves. Using a sharp razor, knife or scissors, slash the top of each baguette at a 30–degree angle in four spots. Each slash should be about 3-4 inches long. Pull out the oven rack with the stone or baking sheet on it and gently slide the parchment with ropes off the baking sheet onto the baking stone or pan. Quickly add the ice. This produces the steam that lets the loaves rise before a crust forms. Bake the baguettes until darkly browned and crisp, 20 to 30 minutes (mine took 20 minutes). Cool before serving, if you can stand to wait. Unused baguettes can be frozen and reheated in the oven. 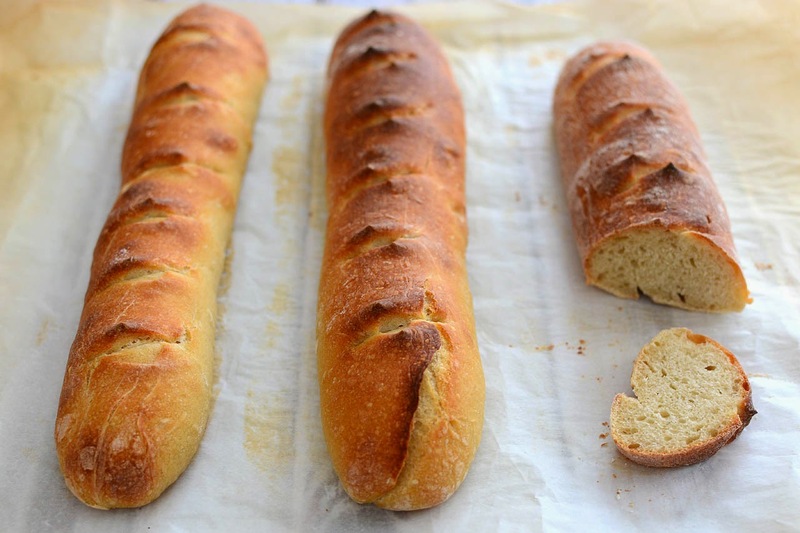 Hello Susan ,you finally made the baguettes, they look beautiful, absolutely yummy and look delicious, love those crumbs ,nice pictures and a write up and thank you for posting the recipe that was nice of you. They are delicious! Thank you, Rosa. Oh wow!!! Your baguettes look divine. I would not need to eat anything else! Beautiful! I need to make more homemade bread or then again, no I don't because I would just eat it. I love bread!!! I know, it's a dilemma :) Thanks, Julie! I love the crunchy crust the best! Thanks, URU! Oh my, your baguettes do look great. What a treat to make these at home. It was a cold day and time on my hands :) They turned out to be a delicious surprise. Thanks, Sam! So pretty on the board..
Me too :) I wish I could eat all I wanted. Now, it's a treat when I make it. Thank you, Monique! Your baguettes looks delicious!! You are such a wonderful baker :) I love bread, especially a good baguette with olive oil, balsamic vinegar and spices mixed for dipping!!! Have a wonderful weekend!! The crust looks SUPER! Definitely worth all the efforts, Susan. Let's see, it's frigid, snowing, I'm sick, haven't been out in a week except to the doc, I have all the ingredients! Maybe not the energy, though! They look beautiful, Susan, I bet they were delicious! Maybe I can get dh to make them, he enjoys the bread making. I'm so sorry you're still sick, Kathleen! I know DH is a good cook so I hope he gives it a try. Great baguettes! I am salivating ! Think I can be happy eating just this and drinking coffee, every day! I feel the same way :) Thanks so much, Joumana. May be time to make some baguettes...yours look picture perfect, Susan! I was quite pleased :) Thanks, Marigene! Nothing beats your rolls, though. I once made Julia Child's French baguettes. The recipe is twenty-seven pages long. After that, these should be a snap. It also comforts me to know that I always have the ingredients on hand--in case of a blizzard. Yes, Go Pack! I wish Rogers weren't hurt though. We'll see! Thanks, Lynn. I so agree, Aldy! Thank you and Happy New Year! I used to make bread quite often in the winter, and need to get back to it! Your baguettes look wonderful! We try not to eat too many carbs either, Debbie but they are delicious. Thank you! That sounds like a delicious way to enjoy bread, Chiara! Thank you, Dear! Oh Susan, they look amazing. There aren't many thing more satisfying than homemade bread! Several rises but be the key. Thank you, Catherine! These baguettes look amazing and totally worth the time! One sniff of homemade bread and I fall in love! Me too :) Thank you, Pamela! These are gorgeous baguettes. I can hear the crunchy crust just by looking at your pictures. 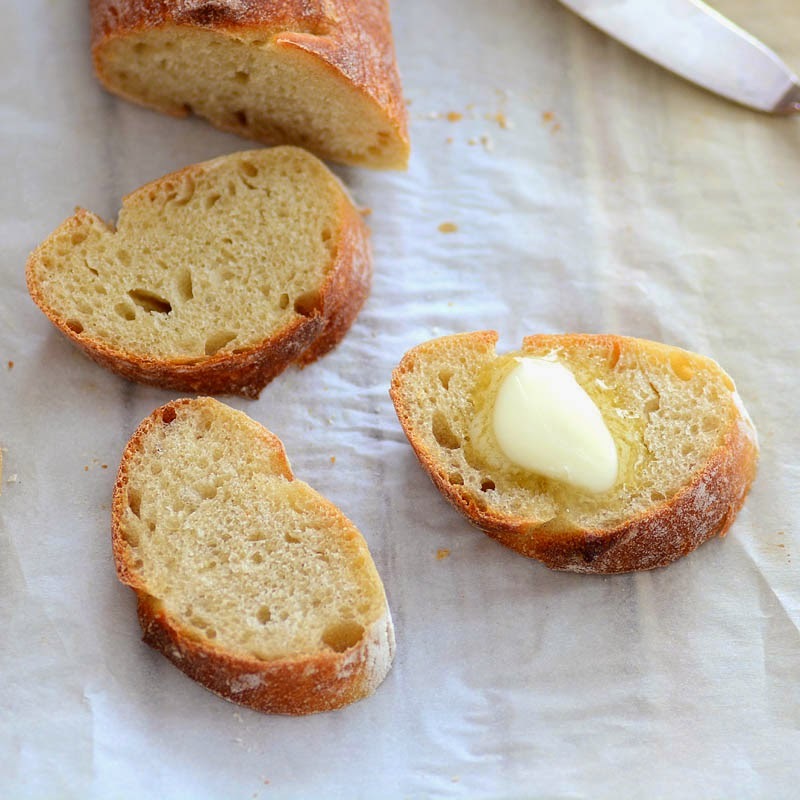 Bread is my #1 most favorite food and I will definitely be trying this recipe soon...even though we seem to be having a heat wave in Utah this winter. Warm bread is welcome at my house any time of year. You are one of the lucky states! Thank you Terri, they were delicious. Thank you so much for your comment and visit, Jayanthi! Aww Susan one of my favorites is make bread! It is so satisfying, isn't it? Thank you, Gloria! I love making bread Susan and these baguettes look absolutely stunning! I bookmarked the recipe to try it! There's nothing like fresh baked bread. Your baguettes look perfect! Happy New Year to you! Your baguettes are perfectly beautiful, Susan. I haven't baked bread in way too long and this looks like a recipe I have to try. I'm planning to make a pot of soup today and it will need some good bread to go with it. You are officially the baguette master. These loaves are beautiful!! 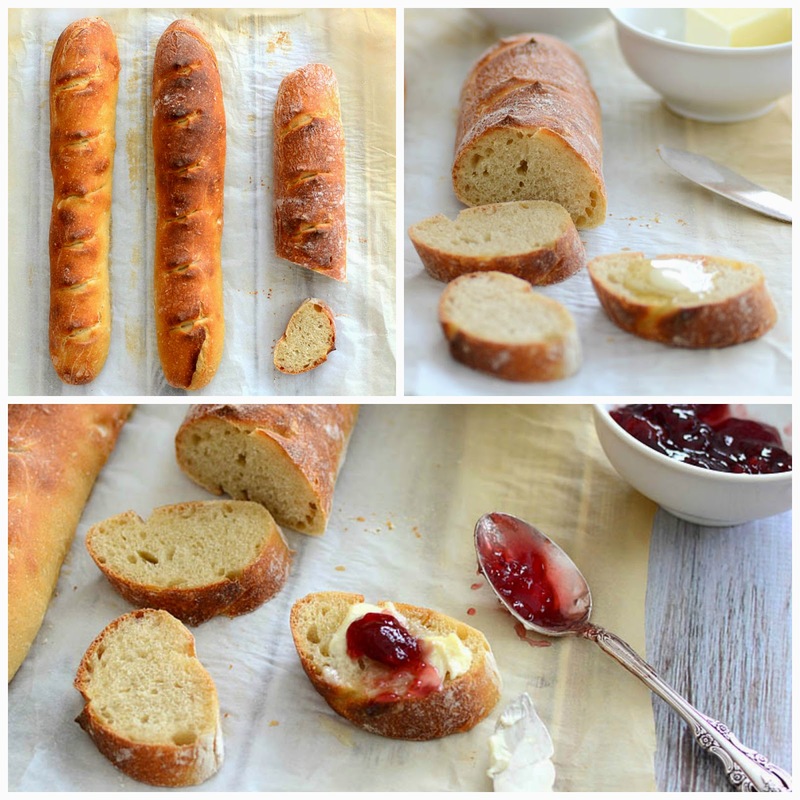 I love baguette and having trying many recipes lately...I will definitely try this version...the baguettes look delicious Susan...thanks for sharing the recipe. 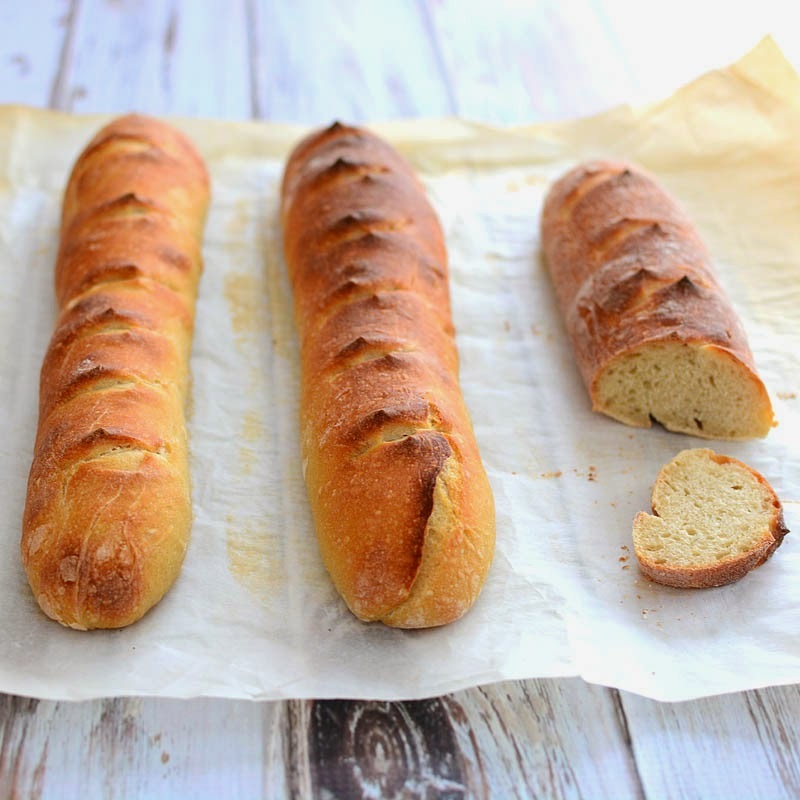 I love bread making, Susan, and will have to try my hand at these fabulous looking baguettes! I wish I had some for dinner tonight.